Built-in Holster for anti sliding grip. 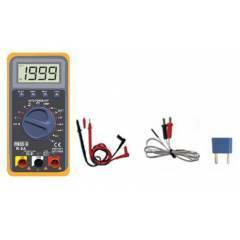 These Digital Multimeters can measure AC Voltage, DC Voltage, DC Current, AC Current, Resistance, Temperature and Battery Test Voltage. Additional Features include Diode Test, Transistor check, Continuity check, Low Battery Display, Maximum Hold, Auto power off, Data Hold and Back light. These Multi Meters can easily fit in the pocket and are used in various industries across various sectors for maintenance and manufacturing. MECO-G R9A Digital Multimeter is a premium quality Multimeters from MECO-G. Moglix is a well-known ecommerce platform for qualitative range of Multimeters. All MECO-G R9A Digital Multimeter are manufactured by using quality assured material and advanced techniques, which make them up to the standard in this highly challenging field. The materials utilized to manufacture MECO-G R9A Digital Multimeter, are sourced from the most reliable and official Multimeters vendors, chosen after performing detailed market surveys. Thus, MECO-G products are widely acknowledged in the market for their high quality. We are dedicatedly involved in providing an excellent quality array of MECO-G Multimeters.